If you're met with sad faces and pouty looks when you close up your family pool for the winter, keep them happy longer by investing in a pool heater. When you purchase one of our top picks for the best above ground pool heaters, you can open your pool earlier and leaver it open longer. This gives you the most use of your pool and keeps the fun going longer. Enjoy more comfortable water when you have a heater for your pool to warm it for those timid swimmers who hate cold water and to relax in a warm soak after a long work day. A heater will allow you to not only heat up the pool water, but maintain it throughout the swimming season. People who live in areas with four seasons enjoy their pool longer, and where the climate is more temperate all year, you could even swim year-round. Add a pool cover and you can preserve the warmer temperatures even longer! There are several choices for above ground pool water heaters and we will look at the types and then give you our editor's reviews of the top picks. Read on to learn more and then buy the pool heater you decide on with confidence. When you want to extend your summer fun and swimming season, but the weather is changing to cooler days and chilly nights, Hayward HeatPro heat pumps provide amazing performance and reliability through any weather conditions. They're durable yet quiet so your backyard remains fun and peaceful for your friends and family! This water heater is out top pick! 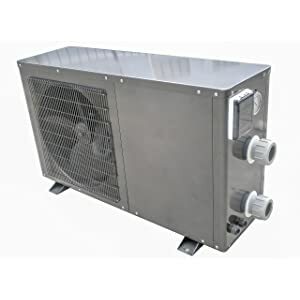 31.2" x 26.5" x 23"
31.2 x 26.5 x 23"
240" x 27.5" x 16"
48" x 1" x 240"
The Hayward HeatPro Titanium pool water heat pump is built with a corrosion-resistant evaporator fin to be durable and resilient even in coastal areas with high humidity. It's fitted with quiet operation compressors and made with body panels that are protected from UV rays and made to prevent rust and deterioration. This pump has stainless steel hardware and is lightweight, compact, and easy to install. 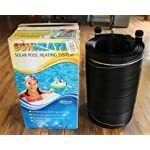 Purchase this pool water heater with a new pool system or to upgrade your existing pool. Enjoy your pool time longer with warmer water temperatures! When problems come up, customers complained Hayward has an unresponsive service department. Decide when your pool season should end by purchasing this Hayward 200,000 pool and spa water heater. A smart design provides reliable, efficient, heating of pool water and this heater is good for the environment with low NOx emissions. Hayward makes this system with durable Cupro Nickel for long-lasting use even when used with salt water pools. 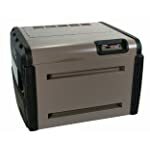 Hayward pool heaters can take high flow rate water and handles all water chemicals. This heating system for backyard pools has an easy to read LED digital panel to keep track of the water temperature and heater operation. You can set the perfect water temperature for your needs! This pool heater tends to have electrical circuitry problems. Capture the abundance of free heat from the sun with the SmartPool S240U Universal Sun Heater. Using a solar heater is the most economical way to use your pool even once the weather becomes chilly. Raising the pool's water temperature 6 to 10 degrees can add weeks or more to your swimming season for only the initial cost of the solar heater. Pool water is heated with this solar unit that provides the equivalent of a 70,000 BTU gas heater. Can raise your pool water temperature 6-10 degrees F! May need more than 1 unit to heat the pool water sufficiently. This heat pump by FibroPool is built with a 100% titanium heat exchange and will operate and heat the water in your pool even in freezing temperatures. Your swimming activities can go on through the end of summer and possibly into the fall season while using this pool heat pump to keep your water warm. This pool heater is for above-ground pools up to a 24 feet round or 15′ X 30′ feet oval and has a 55,000 BTU output. The sturdy case is made from metal and coated with enamel to protect against tough weather conditions. We loved that it has a digital display that's easy to set and adjust. This pool water heater is CE rated, but not UL listed. 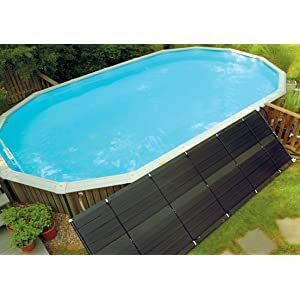 This solar pool heating system by SmartPool makes use of your pool pump to move the pool water through the solar collectors. Abundant sunshine will heat the water, with the sealed tubes keeping it free from exposure to dirt or air, and return it to your pool. The system is made from tough polypropylene material that won't rust, corrode or get scales. The webbed design traps the sun's rays and heats your pool water free! This is an easy to install and use water heating system. The panels have to be removed if they deliver a leak under the tubes making it very difficult to repair. There are three ways to heat your pool water. Below are the types of pool heaters available and how they work. The sunshine is FREE! And it's readily available the world over. So take advantage of a solar heater for your pool water and you'll only have to make the initial investment of the water heater unit. These solar water heaters do take up a lot of space, but they can be mounted on a roof or any other elevated surface where it will get the most sunshine during the day. 2. The surface area will be the amount of square feet you need of solar panels to warm the water in your pool. To get the square feet of the solar panels, multiply W x L.
You would need at least 452 square feet of solar panel surface. Solar pool water heaters are eco-friendly and cheap to operate as long as you have enough sunlight to heat the water circulating from your pool. Check your size pool to estimate the amount of square footage needed and then purchase panels like the SmartPool S240U Universal Sun Heater panels for warmer water and enjoyable swimming. A unit that is made to heat pool water and runs on gas or propane is made with a combustion chamber that has a burner to warm the circulating pool water. Depending on whether you have gas lines available from your home, you can purchase a pool water heater like the Hayward H200FDN Universal H-Series 200,000 BTU Pool and Spa Heater, Natural Gas and use it with natural gas or propane. Some heaters have a Millivolt ignition where a small amount of gas is emitted to keep a pilot light lit. Electronic ignition uses less fuel and is easier to light, also avoiding pilot lights blown out due to wind. Gas water heaters provide warmer water faster than a solar heater, but will cost more to operate. Similar to a gas pool water heater, your pool water will pass through a unit to heat the water and returns it to the pool, but instead of gas, a heat pump uses an evaporation system. The heat pump uses a fan that moves outside air and pushes it over an evaporator coil, warming it and turning it into gas. This warm gas then goes through a compressor to increase the heat and then sends it through a condenser that heats our pool water. Heat pumps are typically less expensive to run than gas water heaters. 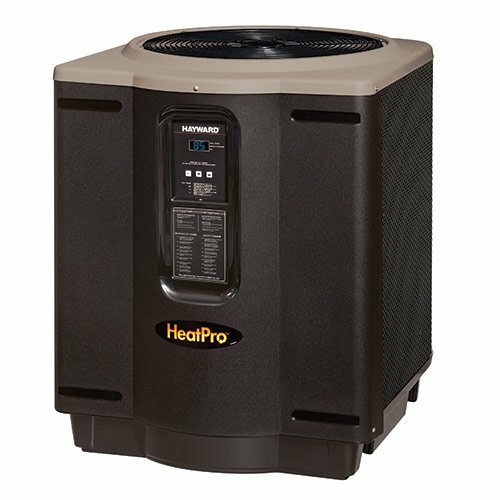 Our top pick, the Hayward HP21404T HeatPro Titanium 140,000 BTU Heat Pump, is a reliable and highly rated water heater with a long track record of Hayward company quality. Keep the kids smiles from turning to frowns when you have to close up your pool for the winter by extending the swimming season with the best above ground pool heater. You'll be glad you made the investment when you're the first family to open your pool in the spring and last family to close it in the fall. Or be the envy of the neighborhood as you use your backyard pool all year round in more temperate climates. Purchase a pool water heater now to keep swimmers happy and make more use of your backyard pool!